On Tuesday, as was anticipated, President Donald Trump withdrew the United States from the Joint Comprehensive Plan of Action (JCPOA), better known as the Iran deal. President Barack Obama responded to Trump's decision to withdraw, excoriating the move and outlining exactly why he considered it to be a mistake. "The reality is clear," Obama said, in part, in a rare statement. "The JCPOA is working — that is a view shared by our European allies, independent experts, and the current U.S. Secretary of Defense. ... Indeed, at a time when we are all rooting for diplomacy with North Korea to succeed, walking away from the JCPOA risks losing a deal that accomplishes — with Iran — the very outcome that we are pursuing with the North Koreans." When he announced his decision to withdraw, Trump described the agreement as "a horrible one-sided deal that should have never, ever been made." Obama, however disagreed, and he appeared eager to get his side of the story across. He shared his statements about the withdrawal on both Twitter and Facebook, where, not unlike Trump, the former president has quite a significant following. Obama described Trump's decision as "so misguided," and also made reference to a seemingly innocuous term that has been heavily politicized since the 206 presidential election: facts. "Walking away from the JCPOA turns our back on America's closest allies, and an agreement that our country's leading diplomats, scientists, and intelligence professionals negotiated," Obama said. "In a democracy, there will always be changes in policies and priorities from one Administration to the next. But the consistent flouting of agreements that our country is party to risks eroding America's credibility, and puts us at odds with the world's major powers." 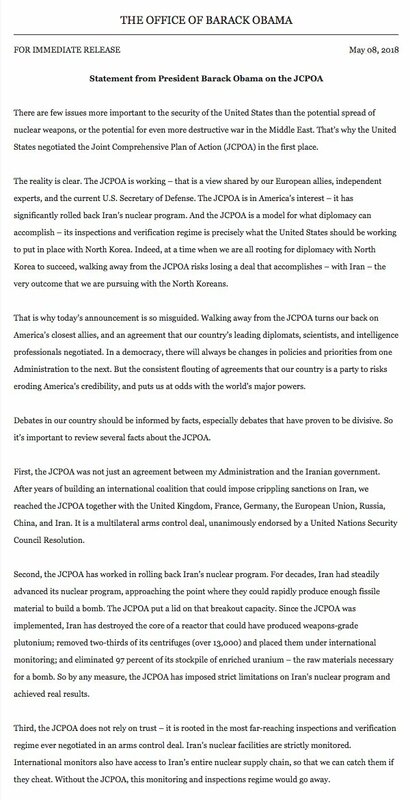 According to Obama, the deal has thus far worked, relies on regular inspections, and Iran is complying. "The JCPOA was never intended to solve all of our problems with Iran," Obama said. "We were clear-eyed that Iran engages in destabilizing behavior — including support for terrorism, and threats toward Israel and its neighbors. But that's precisely why it was so important that we prevent Iran from obtaining a nuclear weapon." Obama was not the only significant figure to condemn the decision. According to a tweet sent by French President Emmanuel Macron, other world leaders were less than thrilled about the United States backing out of the agreement. "France, Germany, and the UK regret the U.S. decision to leave the JCPOA," Macron wrote. "The nuclear non-proliferation regime is at stake." The Iran deal was reached in July 2015, adopted in October 2015, and then enacted and implemented in January 2016. It took nearly two years of negotiations. Trump has long been a critic of the deal. Like anything inherently political in nature, many have taken issue with it over the years. Critics dislike that the deal permits some uranium to be enriched, though as part of the agreement, Iran is required to reduce its overall enrichment by almost 97 percent. It also has to reduce its number of centrifuges, and participate in regular inspections. The uranium that is still allowed to be enriched is permitted under the premise that it is for peaceful purposes. Critics additionally dislike that the deal isn't permanent. In 2030, the restriction on uranium enrichment lifts, caps on stored low-enriched uranium expires in 2028, and by 2025, Iran will be allowed to expand beyond its single enrichment facility. In 2015, President Obama argued that the deal provided the international community a decade to examine the situation and decide how to move forward. The immediate repercussions of Trump's decisions are not yet clear, though if Obama's response was any indication, it could be a bumpy ride.